SIMI VALLEY, Calif. - William Cleary believes aerial firefighting could become child's play. Five years ago, his son drenched him with a water balloon - and got him to thinking. "He was three stories up and I was walking, and he still managed to hit me square in the head," said Cleary, a Boeing engineer. "I thought, 'Why can't we be this accurate with water on fires?' "
So he started working on a system to use giant water balloons to put out wildfires. Now, Cleary has a shared patent, the support of two Fortune 500 companies, and a small team of designers and engineers at his disposal on a project that could change the way fires are fought from the air. The basic concept is simple: Biodegradable plastic balloons 4 feet in diameter hold 240 gallons of water; they are enclosed in cardboard boxes that are torn open by the wind when pushed out the back of a cargo plane; the balloons burst in midair, making it rain in the desert. With the use of GPS coordinates and wind-speed calculations, the balloons could be dropped with precision from a safe altitude high above the flames, the developers say. The balloons - which have yet to be tested on a real wildfire - would be used in addition to the usual aerial firefighting equipment: helicopters with water buckets, and air tankers. After the inspiration from his son, Cleary started tossing water balloons off a parking garage to study their fall. But his project took off when a paper he wrote about his concept won a Boeing innovation contest and $100,000 in research and development funding that went with it. Paper products giant Weyerhaeuser designed the corrugated cardboard container that prevents the balloons from leaking or sloshing around in a plane's cargo hold. The system has evolved over five years from hard plastic beachball-size balloons to the enormous water bladders made by Flexible Alternatives, a Simi Valley plastics company. The water balloons could make any plane with a ramp, a cargo bay, and a specialized GPS system into a firefighter. 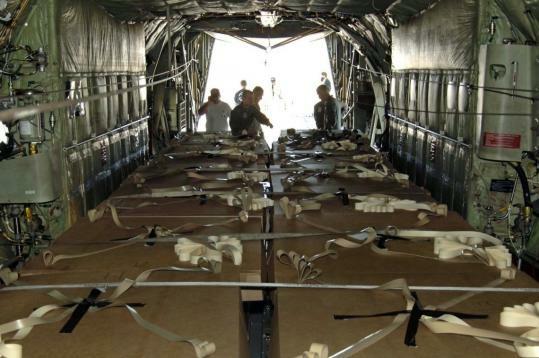 A C-130 cargo plane, which the Air National Guard uses to drop supplies, could fit 16 water balloons, or more than 3,800 gallons of water or fire retardant per trip. An ordinary firefighting helicopter can hold more than 2,000 gallons of water or fire retardant, while the Forest Service's air tankers can hold 2,700 gallons of liquid in a tank permanently installed on each aircraft. The Forest Service has not yet run the numbers to see whether buying thousands of disposable box-and-balloon kits at an initial price of $300 each can save enough money on equipment, manpower, and other costs to make the technology worthwhile. "It costs several millions of dollars to install a tank on an aircraft, and that lasts at least 15 years," said Carl Bambarger, a specialist in aerial firefighting with the Forest Service's Technology and Development Center in San Dimas. Bambarger said Cleary is not the first to come to him with the idea of packaging fire retardant in containers to drop from planes, but he's "the only one who's gotten this far."